Not all that is dark is dangerous. Sometimes, a pinch of darkness combined with imagination and humor can create a beautiful experience. 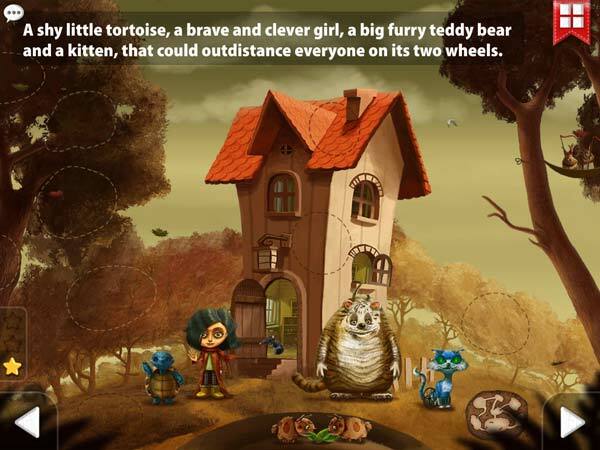 A great example of this is Amelia and the Terror of the Night, a slightly dark yet charming storybook app for juniors. Amelia and the Terror of the Night follows Amelia and her unlikely band of friends on their adventure in Mushroom Clearing. The story of Amelia and the Terror of the Night centers around the titular character, Amelia, who is a brave and clever girl with an unusual group of friends: a shy tortoise called Little Pencil, a big furry creature named TeddyTeddy and a blue two-wheeled cat named Kitty-Patter. Together, the four share a little house in a faraway land called Mushroom Clearing. One day, evil arrives in the form of a devious creature called Whine. A collector of souls, he is known as the Terror of the Night. While trampling the forest near Amelia's house to look for a new addition to his collection, he stumbles upon Little Pencil and steals his soul. To save their friend, Amelia and the others set out to find Whine's hideout. There, they engage in a hide-and-seek battle that ends in Whine's imprisonment in another dimension. TeddyTeddy, with the help of the readers, breaks open the glass bell in which Whine keeps his unfortunate souls. Little Pencil's soul goes back to his body and the friends are united once more. The app combines beautifully hand-drawn artwork with excellent narration and a deliciously dark plot. As suggested by its title and Tim Burton-esque artwork, Amelia and the Terror of the Night is an exquisitely imaginative and rather bizarre tale. The plot deals with topics like (temporary) death and soul-stealing monsters, which may not be suitable for younger juniors. However, if you have kids aged 4+ in the household, you may want to give this app a try because once you move past the dark exteriors, you will see that it also contains positive messages about friendship, courage and determination. Taking full advantage of its digital platform, the app is rich in interactivity. There's a lot you can do; you can tap on dotted areas in every page to reveal hidden animated objects, engage in simple activities like dressing up the main characters and tapping on bubbles, collect 60 stars scattered throughout to unlock a hidden scene and play four mini games. In addition, you can also tilt the device left to right to see the depth of the 3D effect of the illustrations. Like most digital storybooks, Amelia and the Terror of the Night includes an excellent narration. The main characters also have their dialogs professionally recorded. There are currently two languages supported by the app, which are English and Polish. 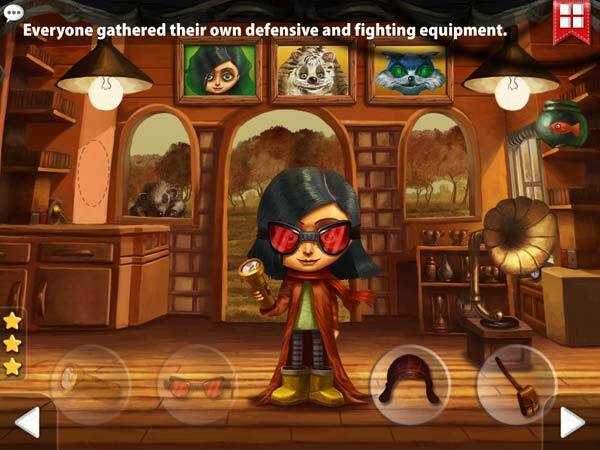 A fully interactive app, there are plenty of activities and mini games to play. In short, almost everything. The moment I opened the app, I was instantly captivated by the compelling hand-drawn artwork that spanned 42 pages. Combined with the beautiful soundtrack that changes with the mood of the story, reading the story really feels like a cinematic experience. In terms of storytelling, the app also does a great job. I really appreciate the subtle messages that the developers try to deliver through the story. Courage and teamwork are definitely some of the values emphasized, but there is also one about acceptance. The fact that the main casts are so different from each other but still maintain a good relationship is a great example for both juniors and adults. Finally, I also think that the app has great interactivity. Even though the number of interactive elements in a page can be overwhelming at first, I do think that they are excellent entertainment after you have finished the story. I also enjoyed the mini games included - the musical memory game with toads are hilarious and the insect tic-tac-toe is a fun surprise. 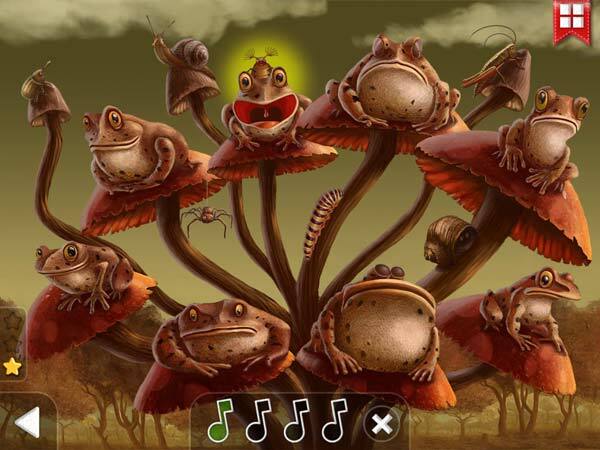 One of the mini games included is a musical memory game featuring funny toads. Amelia and the Terror of the Night is excellent. 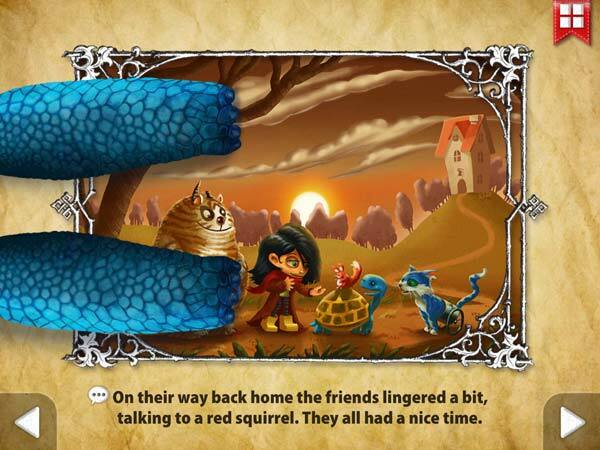 It is also one of the most beautiful storybook apps that I have reviewed. Despite the slightly macabre theme, it is only mildly scary and mostly edgy. If you have older juniors in the household, this would make a great app for them.